Craft beer is trendier than ever. If you’re a lover of beer and all its types, flavours and colours, you are definitely in the right province. There are over 100 different microbreweries in Quebec, producing thousands of varieties of beer. In Montreal alone, dozens of locations offer a taste of these great brews. Before I recommend different beers, breweries and pubs, I feel it’s important to make one basic yet vital distinction between two beer types. The difference between an ale and a lager comes down to the brewing process and the way the yeast ferments. Ales include pale ales, India pale ales (IPA), stouts, porters and wheat ales. Ale-brewing is typically done in warmer temperatures, which make the yeast ferment faster, and ultimately makes for a richer, more flavourful and complex beer. Lagers usually have fresher, crisper flavours. While ales are top-fermenting, meaning the yeast brews at the top of the barrel or cask, the yeast in lagers brews at the bottom of the barrel. Lagers brew in colder temperatures, which explains their simpler and lighter flavour. Lager styles include pilsners and amber beers. Now that that’s all settled, let’s get to the goods. Dunham’s Saison du Pinnacle (left), Helm’s Bernard Pale Ale (centre) and Pit Caribou’s La Bonne Aventure (right). Located in the small town of Dunham, Que., this brewery is award-winning. While a bit more on the expensive side, Dunham beer is the perfect purchase for any cinq à sept or celebration because the ingredients are often more refined. What’s great with beer is that, even if you’re getting the fanciest brew, you never come close to spending as much as you would for the fanciest bottle of wine. Many of their 750 ml bottles sell between $13 and $30. From this microbrewery, I highly recommend their award-winning Saison du Pinnacle. The beer is light and summery, while keeping a strong bitterness. It has undertones of peach and lemon. Other great beers from the brewery include the Saison Framboise, their Black Imperial IPA and my personal favourite, their Leo’s Early Breakfast IPA. The latter has a subtle Earl Grey tea taste—a flavour that complements many alcohols. You can buy Dunham beers at a variety of specialty stores and bars, including Marché Station 54, Au Coin Duluth, and the bar Vices et Versa. If you’re adventurous, this is your brewery. From a beer brewed with cocoa and vanilla bean, to a delicious espresso stout, to an intense, dark, smoky amber beer, this place does it all. But don’t worry, they’re not all play. They have well-crafted basics, from a blonde to a white beer, and a classic, crisp pale ale. The microbrewery is located in Montreal’s Mile End neighbourhood, at 29 Laurier Ave. East. 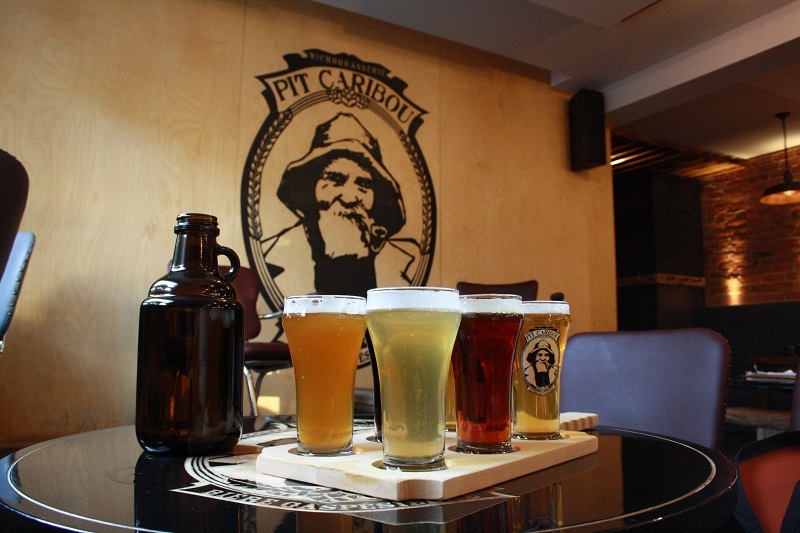 This Gaspésie-based microbrewery opened their Montreal location last summer. This brewery’s beer is simple yet full of flavour. The beer that peaked my interest at this spot is their red beer, La Bonne Aventure. The beer is light but has the caramel and nutty undertones I absolutely love in any darker beer. Their Montreal location serves a sample beer platter, perfect for first timers who want to taste a bit of everything. Pit Caribou’s Montreal location is at 951 Rachel St. East in the Plateau.